The Disney-owned publisher beat out HarperCollins in the final round of bidding with a $6.7 million offer for the sought-after book. Hyperion just won the two week long auction for a book about the life lessons of a dying professor that could become the next Tuesdays with Morrie. According to industry sources, the Disney-owned publisher acquired world rights to The Last Lecture through sheer determination and a $6.7 million bid, beating out HarperCollins in the final round. David Black, the agent for the book, declined to comment, and a spokeswoman for Hyperion could not be reached. 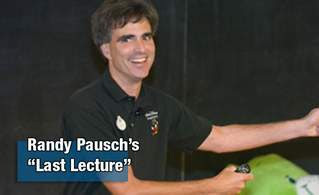 The Last Lecture will be a collaboration between Carnegie Mellon computer science professor Randy Pausch, who delivered his so called last lecture on September 18, and Wall Street Journal columnist Jeff Zaslow, whose column about the lecture started the giant media snowball rolling. The 47-year-old professor’s witty, heartfelt talk, which included slides of his cancer-ridden pancreas, became a YouTube sensation and led to appearances on Oprah, Good Morning America and CBS News with Katie Couric. In his pitch letter to publishers, Mr. Black promised a short book that would use the actual lecture as a “foundation,” and then delve into the experiences behind its conclusions and lessons.